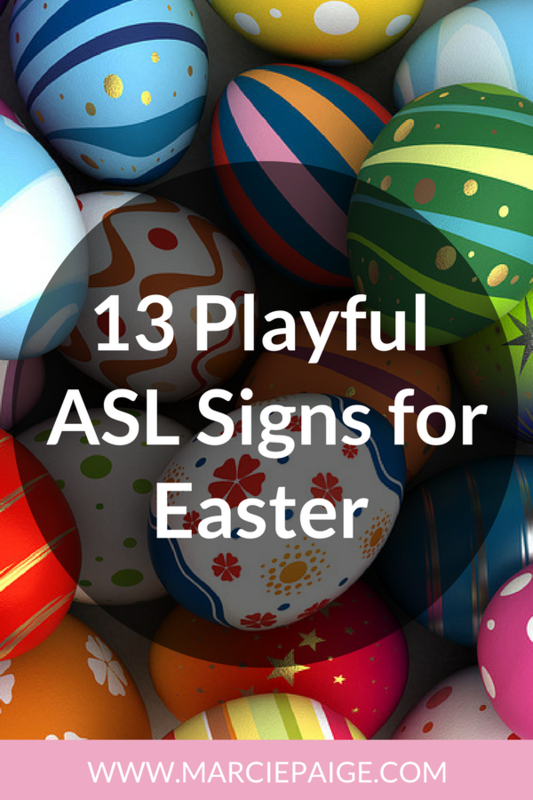 In this video, I’m going to teach you 17 festive ASL signs for Thanksgiving. These are fun and practical signs you can use with your kids during this special holiday weekend. It’s not necessary to teach your kids all of these signs, but for all you over-achievers out there – go for it! 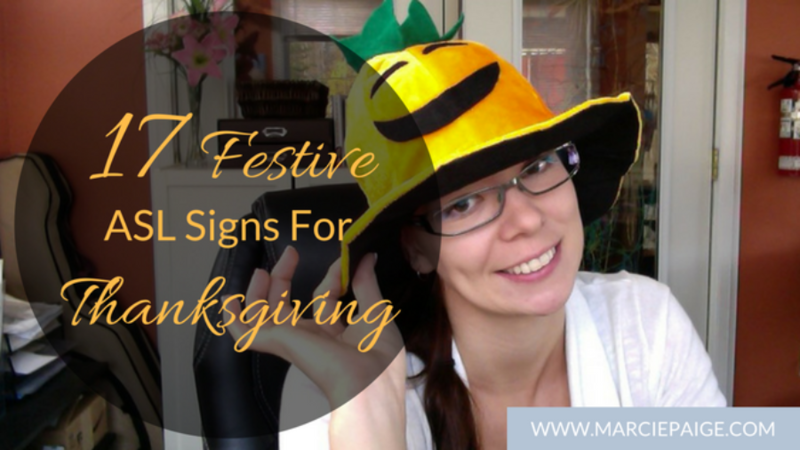 Just pick the signs that mean something to your family – then watch for their huge smile when you sign TURKEY at the dinner table! Family – Make the sign for F (thumb and pointer finger touching, other fingers pointing up) with both hands. Then circle it around to show a group of family members. Friends – To make the sign for FRIEND, hold out both index fingers hooked in a C shape. Hook your fingers together, release and switch with the other hand on the bottom. Home – To sign HOME, use your dominant hand to make a flat O hand shape. Touch the side of your chin with your fingertips, then move up and touch your upper jawline. Pilgrim – To sign PILGRIM, make the P hand with both hands. Then draw a bib on your front. Start at the center of your upper chest, move out and down. Thankful – To sign THANKFUL, (similar to Thank You) place both flat hands near your chin and move them down and away from you in a double movement. Feast – To sign FEAST, (similar to EAT) make a flat bent hand with both hands (thumbs out), bring one hand up to your mouth then the other in a circular motion. Chair – To sign CHAIR, with each hand take your middle and index finger and hold them curved together. Take the two fingers of your dominant hand and tap them with your two fingers of your other hand. Pumpkin – To sign PUMPKIN, make a fist with your non-dominant hand. Then flick the back of your fist with your middle finger of your dominant hand. Pumpkin Pie – To sign PUMPKIN PIE, first sign PUMPKIN (shown above), then sign PIE. Hold out a flat hand and with your dominant hand make 2 slices of imaginary pie with the edge of your hand. Mashed Potatoes – To sign MASHED POTATOES, make a fist and smash it into your other palm. Then sign POTATOES by poking the back of your fist 2 times with your pointer and index fingers. Vegetables – To sign VEGETABLES, make a V shape with your dominant hand. Touch the side of your chin with your pointer finger (palm facing out), then twist your hand around and touch the side of your chin with your middle finger (palm facing towards you). Bread – To sign BREAD, make a fist with your non-dominant hand. Then draw slices on the back of your fist with the tips of your fingers. Butter – To sign BUTTER, hold out your flat hand in front of you. Then with your dominant hand, use your pointer and middle fingers to spread butter on your palm. Delicious – To sign DELICIOUS, touch your thumb and middle finger together. Place near your mouth, and as you move your hand up and away from your face… slide your middle finger across your thumb. (and make a face that shows your food was delicious!